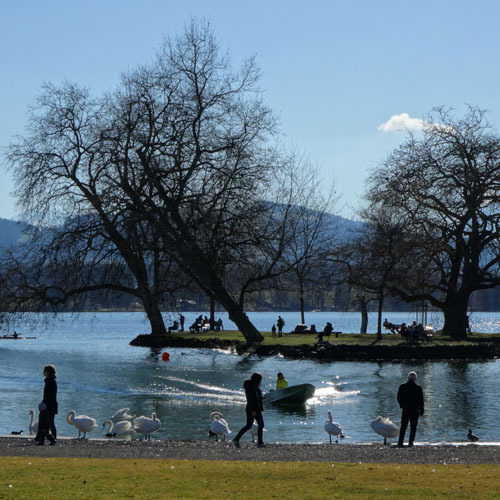 Families enjoying an early spring day at the shore of Lake Zug in Switzerland, make a lively picture for the photo observation game. This part of the lake is near the municipality of Cham on the Lorze River. The word ‘Cham’ means ‘village’ in Celtic, and these shores have been populated for at least 6,000 years; a number of Bronze Age finds have been made in Cham, including some settlements. Perhaps rather unimaginatively, Cham is twinned with a town in Germany called – well, ‘Cham’. The climate of Switzerland is officially described as ‘moderate’, with warm summers and extreme weather mostly confined to higher altitudes. It’s ‘Continental’ climate really means that summers are hot (even up to 30⁰C) and Winters quite cold, with snow cover usual from December to March. For each 300m of height you get average temperatures 5⁰C lower than in the valleys.